New stepped version allows maximum control over cooking area. Heavy-duty stainless steel welded construction with new cast iron grates. Cast Iron burners generate 28,000 BTU/hr each. Stainless Steel drip pan. Available in 2, 4, and 6 burner versions. Field convertible gas regulators. APW Porta-Stove Electric Hot Plates are portable, yet sturdy! 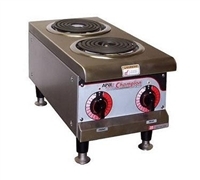 Choose from a single or double burner hot plate. Double hot plate has 1250W and 550W burner separation. 66” Cord and plug included with each unit.